I am a huge fan of the Paumes series of books, and this year ordered several more for Christmas (again! sweet joy!). My only disappointment came on hearing that the edition on Children’s rooms in Holland was out of stock, and out of print. Now that we have a house to "make our own" as it were, I am desperate for design inspiration. I love design shows, and all things creative, but find myself at a complete loss when it comes to actually designing a space. One thing we are thinking of is having Tomas paint a mural of sorts on the walls, or having vinyl decals made from his drawings. 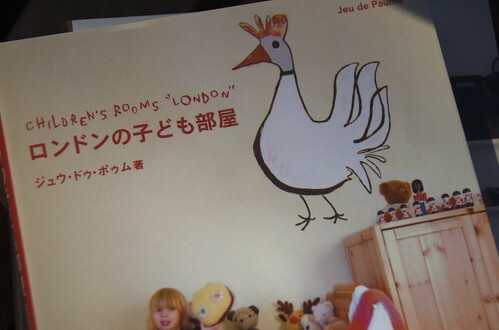 I especially like the bird pictured above from Children’s Rooms "London" — and love the idea of simple, but bold line drawings. 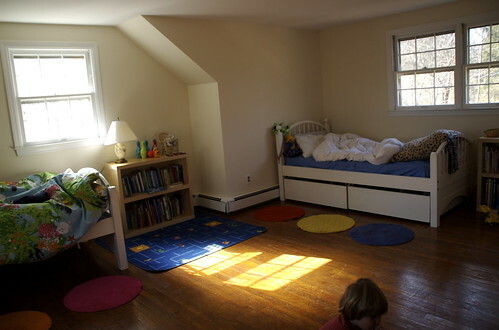 Here are a couple pictures of the kids’ room as it is now — what would you do to bring some punch and character it? Wow, the lines of the room and all that light give it a lot of character already!!!!!!! I really love the windows. You could put wallpaper in matching colour tones above each childs bed and have matching bedlinnen? i love love love that your kids share a big happy room! it reminds me of nanny mcphee :) that would be my ultimate dream (and probably my kids worst nightmare, haha). love the paintings you have done! Your kids room was really cool. 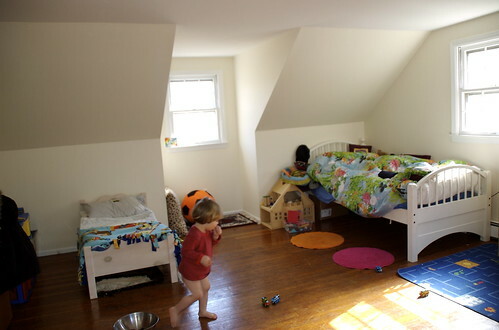 I love attic and another thing, it’s right to make your kids room in one. Why? for them to get close as they grow up.